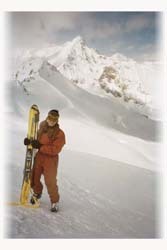 An expert eastern skier, still my experience with powder was minimal and time logged in helicopters was nil. A quick scan of the tribe shows only three women, myself included, in a sea of forty resolute men. The group’s origins are an international blend of US, Canadian, British, German, Dutch and Italian. Our territory is not Africa, the Australian Outback, nor a remote island of Borneo. It is British Columbia, home to the legendary Canadian Rockies near Panorama, Banff, Lake Louise, Revelstoke, and Kicking Horse. Our expert Canadian Mountain Guides privately discuss their strategies and divide us into four teams of eleven, we are welcomed to a buffet breakfast. Some eat as if this is their last meal, others like myself can only nibble nervously. The excitement level in the room is noticeably elevated. Briefing on helicopter safety and the operation of avalanche transceivers takes 45 minutes. As a practice drill, the guide hides his transceiver, emulating that he is lost in a slide, and our newly formed “tribe” must find him. Finding a buried skier as an immunity challenge, all eleven of us would have been voted off. But we had paid to play, so we endure further rules and reg’s before we are cleared for take off. Powder skis, included in our package, await us emblazoned with our names on duct tape labels. Atomic bright yellow fat skis that are designed to float on the deep powder become our toys for the day. Boarding the helicopter, the thumping whine of the chopper blades matches the excited beat of my heart. The gale force wind from the propellers rushes around us as we file into the helicopter bench seats and buckle in for a gripping ride. Soaring 11,000′ – It’s worth the price of admission just to see the jagged peaks of the Purcell Mountains. The helicopter pilot swoops down into a snow-covered valley, and up again – like a bird. 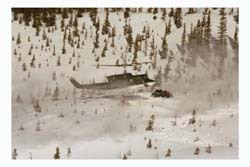 The heli-guide explains that the majority of the premium bucks for heli-skiing goes toward keeping the Vietnam vintage $2.5 million Bell 212 helicopter in mint condition and topped off with costly jet fuel. Scouting for perfect powder is an exact art. The guides’ primary concern is avalanche and crevasse danger. R.K. Heli Company has access to a territory of 780 square miles. That is 70 times more terrain than Whistler/Blackcomb ski areas combined. Finding a helicopter landing, however, is not a concern. Our pilot perches the chopper on a space smaller than my bathroom, a knife’s edge mountaintop, for the 2 minutes it takes us to disembark and crouch in our huddle. Then with a fury of wind, noise and snow – the chopper leaves us to our new surroundings of nothing but immense mountains and astonishing silence. Our virgin ski run of 2,500 vertical feet is a spectacular glaciated snowfield blanketed with deep fluffy powder. Our adept ski guide leads the way, leaving his flawless signature in the snow for us to follow. He points his pole at concealed crevasses and potential slide areas as we stop to catch our breath and take “if my friends could see me now” photos. Token snowboarders, 2, are understandably tempted to rip some huge arcs in the wide-open bowls. That is a no-no, grounds for tribal council. We had been instructed to ski within a pole’s length of each other’s tracks (no powder pigs), and always behind the guide (or you could ski into “grave” danger). With wide skis, we float down the moderately pitched glaciers one by one; often matching powder turns forming picture perfect eights in the snow. I am surprised, and frankly relieved, at how my boards glide through the billowing snow as I bounce from one soft turn to the next. The smiles among our group are almost unanimously ear-to-ear. 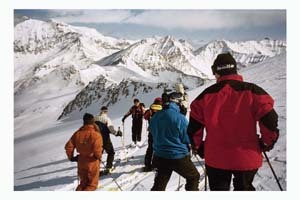 R.K. Heli has the unique offering of day helicopter ski trips. This is an ideal add-on to a ski resort vacation in the Canadian Rockies. You can do a day and try your wings at heli-skiing without committing to an entire week. Most helicopter ski operations offer 3-7 day trips for $4,000-$12,000, including accommodations, meals, fat skis, and 10,000 to 15,000 vertical of skiing per day. 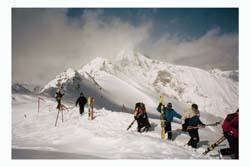 Heliskiing is best suited for expert skiers and snowboarders in strong physical shape who are able to “survive” all types of conditions and terrain, not just steep and deep. 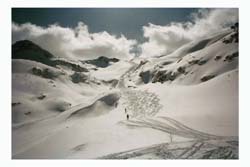 This is wilderness skiing in an uncontrolled environment. If you are not certain, then you should not sign up. Our heli ski day was rewarding, with billowing powder off the magnificent Rocky Mountain summits in glorious sunshine. 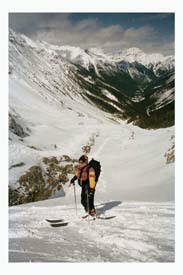 It was a life-altering experience, no lift lines, no trail signs, just 35 feet of snow on the remote Farnham Glacier.